Usability panda: Home page, anyone? But that’s coming from my Twitter network, so a pretty tech savvy and a rather biased sample. To get more info, I talked to sales people in the office as they are quite ‘normal’ compared to online geeks. The results, obviously, were quite different: they don’t change the default page, they use Google and if Google wasn’t there as a default they would set it up, they add there email or MSN or BBC News, etc. So nothing surprising. There’s also a special type of people who like to use their speed dial for weird things. Fortunately, there aren’t that many of us. 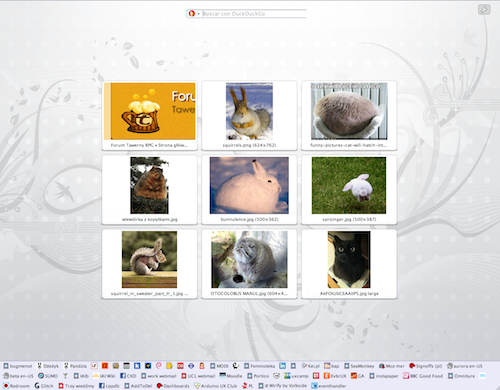 To get a full picture, I also asked people from Opera and Mozilla about any stats they might have. Turns out that Opera doesn’t collect such data, which is a shame. I didn’t manage to get any Firefox data either, but I came across the results of the new tab research posted by Firefox Research Team. Not exactly what I was looking for, but still useful as they seem to be moving towards the Opera-like speed dial and it means that a) new tab behaviour will be relevant in this context, b) they will have stats. The reason I decided to quickly find out if there’s any research on the topic was a persona I was reviewing that had Zoo set as his home page (whaaa….?). My first reaction was: Oh dear, what a sad person. Second reaction was: Wait a minute! No one uses home pages anymore! Well, turns out people do use them, but it’s not a “home page” anymore – now there are home tabs, speed dials and frequently visited sites panels. Suddenly Zoo on of those sounds quite likely (but still rather sad).